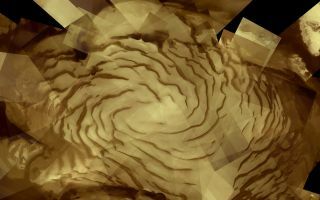 This space wallpaper shows the north polar ice cap of Mars, presented as a mosaic of 57 separate images from the High Resolution Stereo Camera on ESA’s Mars Express. The ice cap spans approximately 1000 km and is seen here in polar stereographic projection. This space wallpaper shows the north polar ice cap of Mars, presented as a mosaic of 57 separate images from the High Resolution Stereo Camera on ESA’s Mars Express. This image was released June 3, 2013.